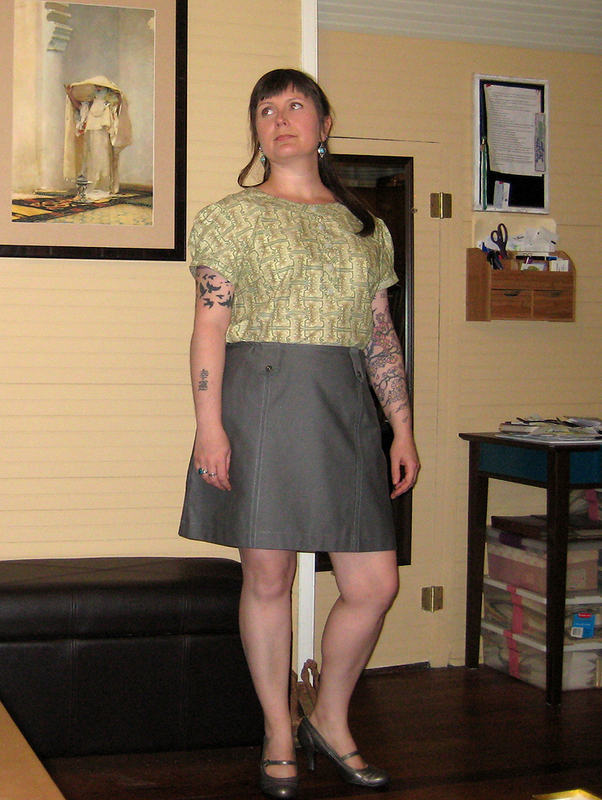 I left off the sleeves and edged it in black bias tape. The pattern calls for buttons on the faux placket detail, but I thought with this fabric it actually looked better without them. I’ve actually worn this a bunch. 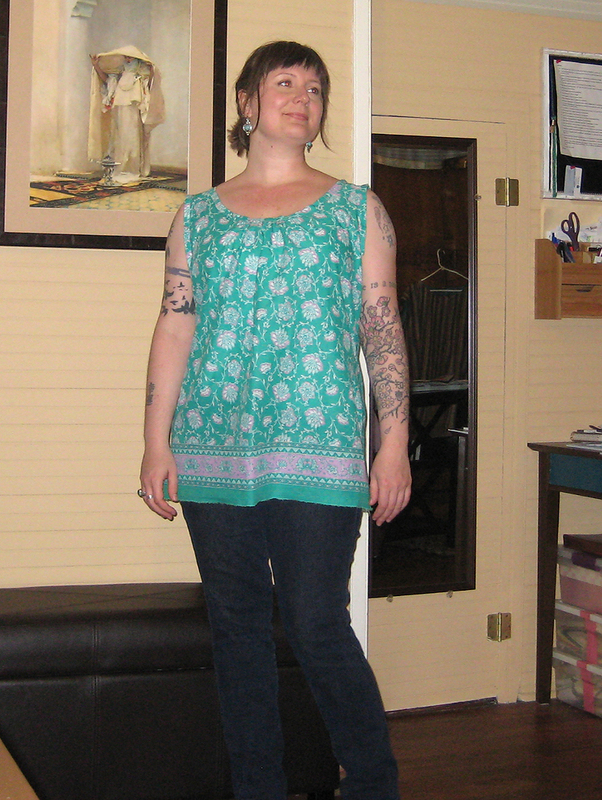 Despite the fabric’s weird chartreuse coloring and pattern, it’s really comfortable and summery. YAY! I haven’t tried it yet, but I suspect the blouse will get some wear untucked and belted with jeans or something. I just really love it’s funny little Art Nouveau print and care not all that it’s really too busy for this pattern. 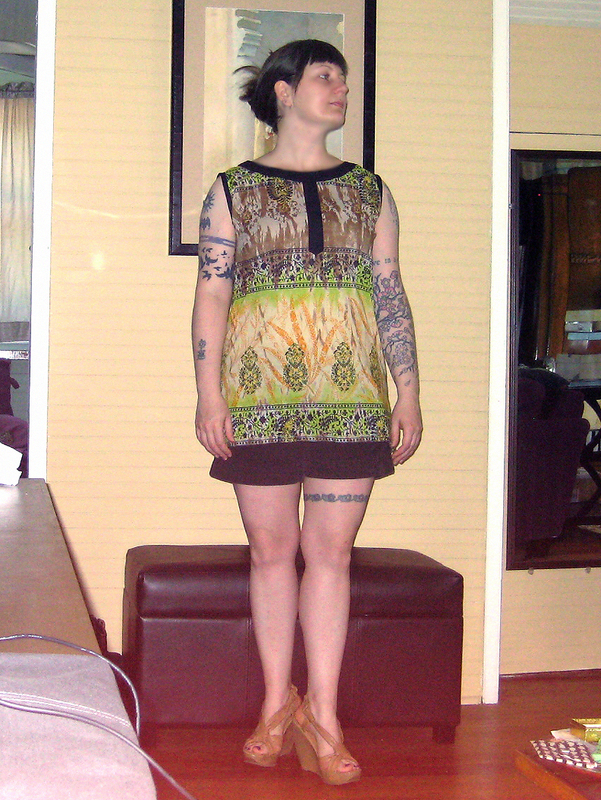 I have the shift dress cut out from this pattern as well, in some grey cotton twill. I’ve been having trouble deciding on a color to go on the collar/placket, as everything I’ve picked looks too matronly or too twee. Hoping to finish it this week. 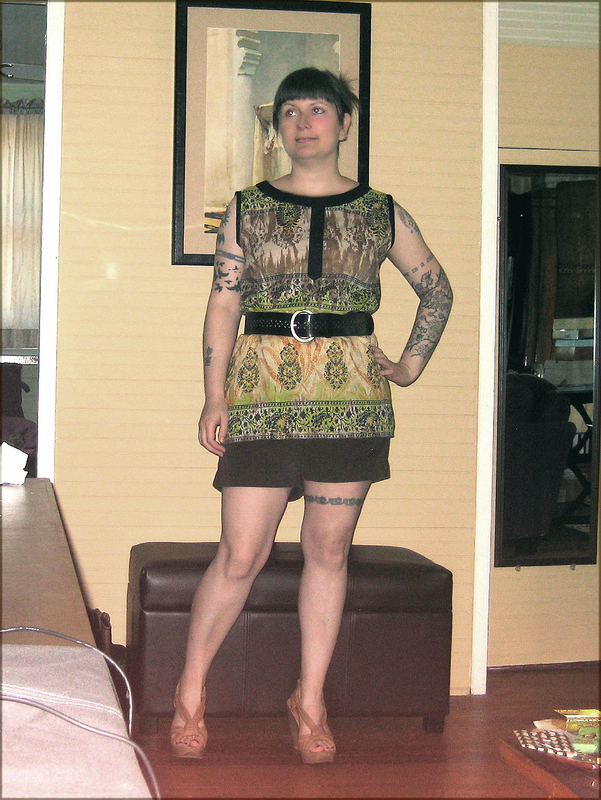 I have been working the long promised bird dress as well. It’s nearly done, just needs hemming and finishing on the sleeves and neck. 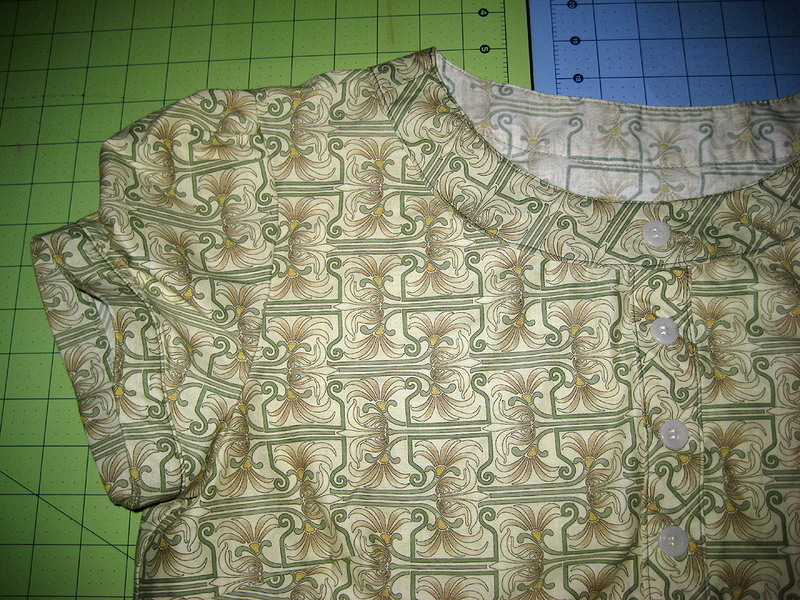 However, I’ve decided to forgo the tie belt the pattern calls for and make my own self fabric belt with a buckle. This will surely end up being more work than the whole dress, but hopefully it’ll be worth it. I used Simplicity’s Cynthia Rowley 2586. Holy cow, is there a lot of ease in this! 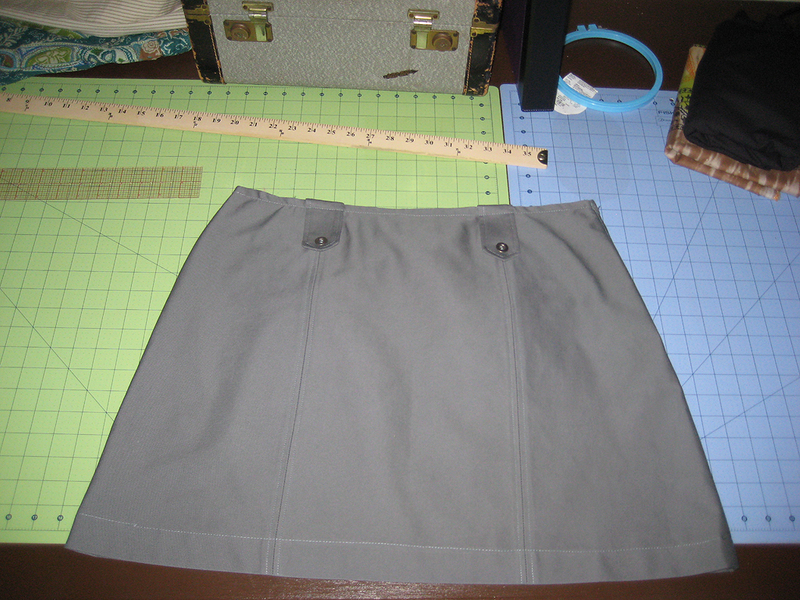 This is down two sizes from what my measurements said I should cut and I’ll probably take another 3 inches out of the side seams before I wear this out. I’m really glad I muslined this. My plan is to make a dress from it next and I would have been swimming in huge tent if I’d done that! Last month’s wadder is still hanging around. I’m thinking I might try and recut it into the Cynthia Rowley pattern. Hopefully I can mange that with out confusing myself too much and destroying all the fabric. Categories: craftygirl, crankypants, dharma time, pretty as a picture | Permalink.